Michelle Milton is a digital marketing communications consultant and entrepreneur based in Melbourne. She splits her time between helping corporates manage their digital communications and publishing her website High Tea Society which has grown to become a global phenomenon. Milton spent her early career working in London on a European Union project for the new media industry during the late 1990’s. The exposure to this emerging industry set up Michelle’s interest in digital media. Since returning to Australia she worked as a consultant on range of digital projects. High Tea Society has received international recognition and now has an audience of over 130,000 subscribers, fans and followers. Brands have worked with High Tea Society through sponsoring geo targeted email offers, competitions, venue directory listings and website advertising. High Tea Society will celebrate 10 years of publishing in December 2018. 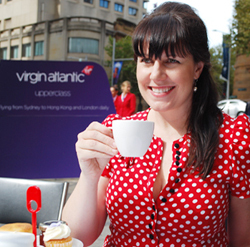 Speaking topics: social media marketing, digital publishing, high tea and startups.